I love re-tellings. I mean. Love them. I love it when Authors take something that is a beloved classic, and twist into something totally different that a new set of readers can love. So When I saw " Modern Spin on Mary Shelly's Frankenstein." I immediately thought " Must read!" I started reading Broken and immediately felt.. depressed. But thought to myself. " this is a good thing, it means that the readers emotions are effecting me deeply." But the feeling never left. Throughout the entire story I just kept thinking, this is sad, this is depressing. Then there were the parts that simply annoyed me. Emma keeps mentioning her Gothic Fiction reading hw. But NEVER says the name of the book. It felt.. so... awkward and fake! Any reader could guess. It's terribly obvious. It just felt like the author was.. trying too hard, to hide the title of the book, and it came off simply annoying. Here is the thing. I kept reading. I kept wanting to know what happened. So I can't say that I hated this book. because I didn't hate it, I simply.. didn't really enjoy it. Overall. 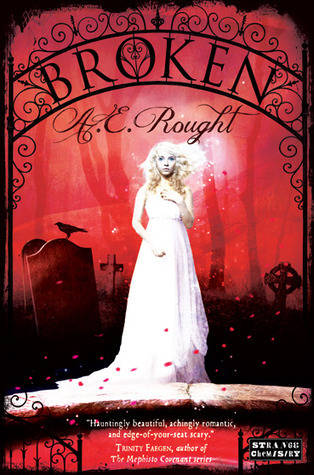 Broken by A.E. Rought wasn't for me. It was predictable, and depressing, and though I felt drawn to get to the end to see the outcome, I just didn't enjoy it as much as I wanted to. But hey, i'm also a weirdo who doesn't like Dark Chocolate, so there is bound to be readers out there who's opinion varies from mine. I agree with you on this one, and your comparison to dark chocolate is perfect. It's exactly like that for me too. I did feel really irritated by the homework assignment and it felt like it was trying to hard. I loved the whole idea of it, it just didn't work out like I'd hoped. I'm glad that my comparison made sense >.< I was afraid everyone was gonna be like.. huh? lol Yes, the HW assignment drove me up a wall. I feel like they could have said what it was and it would have mixed in just fine. Would have helped even! I love dark chocolate, but I get your point. That is too bad, because from the blurb I was all like "OMG that sounds great!" because I love re-tellings too, but then I read your thoughts ... and I get it. Not everything can be a 5 star. Aww. Sorry to see that this book wasn't meant for you. I thought the idea sounded cool for it (retelling and all) but I wasn't *that* interested. And I really dislike it when the book just stays so depressing all the way through. Don't eat the dark chocolate! It's no good! 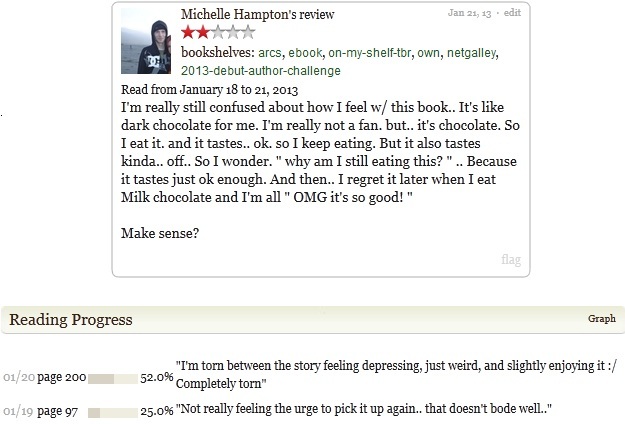 (I don't like dark chocolate, either) Great review, though! I'm not a fan of dark chocolate either, but I will eat it if it's given to me. It is still chocolate after all, lol. I had wanted to read this book (not with a passion or anything, but just in the general sense that I want to read about 95% of YA, lol) but now probably not. I'm not a fan of depressing books. It just doesn't sound good. Great review! I haven't read this book but I have a feeling I wouldn't like it. Great review! (I don't like dark chocolate either).